This series on Pioneers in Arts, Humanities, Science, Engineering, Practice (PAHSEP) presents eminent conceptual thinkers, scholars, policymakers and practitioners who—as pioneers in a specific field of research or an area of political debate—have had an innovative, long-lasting national, regional or global impact on issues crucial for humankind in the twenty-first century. This book series will present the work of distinguished scholars in the arts, in the humanities, in the natural or social sciences, in engineering and in practice—from many disciplines and from all parts of the world—who have inspired scientific and policy debates and who with their conceptual and scholarly work have introduced new areas or topics of scientific analysis, research and teaching. The series on Pioneers in Arts, Humanities, Science, Engineering, Practice (PAHSEP) will also include influential and successful policymakers who have had a major impact on domestic societal change, multilateral diplomacy and decision-making, primarily in their own areas of expertise. 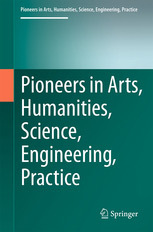 The goal of this series on Pioneers in Arts, Humanities, Science, Engineering, Practice (PAHSEP) is in each case to publish selected major texts by a pioneer in a particular field of scientific analysis and political practice together with a biography and a bibliography—or for practitioners a survey of their major policy speeches and the decisions they have influenced. The reader who is interested in the impact of new ideas on scientific and technological innovations in different disciplines and of innovative policy decisions on national and international policies can thus easily access the overall work of the pioneer presented. Each pioneer in the PAHSEP series will be introduced by a colleague who is familiar with the pioneer’s innovative work as a scholar or practitioner and who will place her or his work in the context of one or more scientific disciplines or political issue areas. This will be accompanied by a personal and professional biography and a comprehensive bibliography, or in the case of policymakers with a brief survey of key innovative policy decisions. Then, the pioneer or a colleague will introduce selected benchmark papers, place them into the context of the author’s own work, and reflect on the impact they have had on the continuing scientific, technological or policy debate. All books in this series range from 55,000 to 250,000 words, and are published as printed books in Hardcover and as eBooks, and are also available as individual chapters. All members of academic institutions globally that subscribe to the relevant book package of SpringerLink have free access to these eBooks and may obtain MyCopy <http://www.springer.com/librarians/e-content/mycopy?SGWID=0-165802-0-0-0> at a highly discounted price. 6 J. Russell Boulding (Ed.) Elise Boulding: A Pioneer in Peace Research, Peacemaking, Feminism and the Family: From a Quaker Perspective (2017). 8 J. Russell Boulding (Ed.) Elise Boulding: Elise Boulding: Writings on Feminism, the Family and Quakerism (2017). 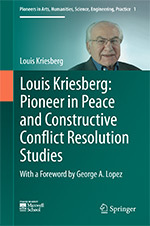 Louis Kriesberg: Louis Kriesberg: Pioneer in Peace and Constructive Conflict Resolution Studies (Cham – Heidelberg – New York – Dordrecht – London: Springer International Publishing, 2016). Richard Ned Lebow (Ed. 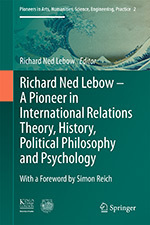 ): Richard Ned Lebow: A Pioneer in International Relations Theory, History, Political Philosophy and Psychology – Presented by Simon Reich (Cham – Heidelberg –New York – Dordrecht – London: Springer International Publishing, 2016). Richard Ned Lebow (Ed. 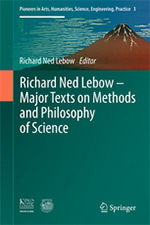 ): Richard Ned Lebow: Major Texts on Methods and Philosophy of Science (Cham – Heidelberg –New York – Dordrecht – London: Springer International Publishing, 2016)..
Richard Ned Lebow (Ed. 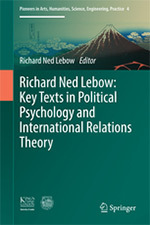 ): Richard Ned Lebow: Key Texts in Political Psychology and International Relations Theory (Cham – Heidelberg –New York – Dordrecht – London: Springer International Publishing, 2016). Richard Ned Lebow (Ed. 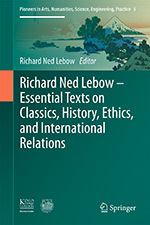 ): Richard Ned Lebow: Essential Texts on Classics and History and Ethics and International Relations (Cham – Heidelberg –New York – Dordrecht – London: Springer International Publishing, 2016). J. Russell Boulding (Ed. 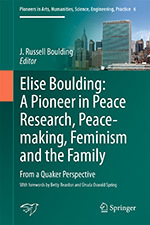 ): Elise Boulding: A Pioneer in Peace Research, Peacemaking, Feminism and the Family: From a Quaker Perspective, with Foreword by Betty Reardon and Preface by Úrsula Oswald Spring (Cham – Heidelberg –New York – Dordrecht – London: Springer International Publishing, 2017). J. Russell Boulding (Ed. 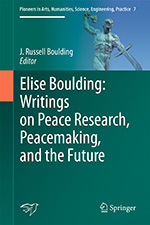 ): Elise Boulding: Writings on Peace Research,Peacemaking and the Future (Cham – Heidelberg –New York – Dordrecht – London: Springer International Publishing, 2017). J. Russell Boulding (Ed. 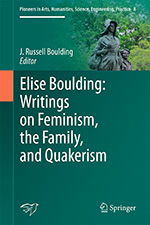 ): Elise Boulding: Writings on Feminism, the Family and Quakerism (Cham – Heidelberg –New York – Dordrecht – London: Springer International Publishing, 2017). J. Russell Boulding (Ed. 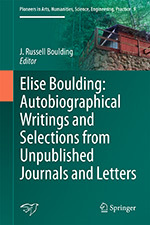 ): Elise Boulding: Autobiographical Writings and Selections from Unpublished Journals and Letters (Cham – Heidelberg –New York – Dordrecht – London: Springer International Publishing, 2017). Patricia M. Shields (Ed. 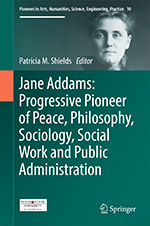 ): Jane Addams: Progressive Pioneer of Peace, Philosophy, Sociology, Social Work and Public Administration (Cham- New York - Heidelberg - Dordrecht - London: Springer International Publishing, 2017). Lucas Melgaço - Carolyn Prouse (Eds. 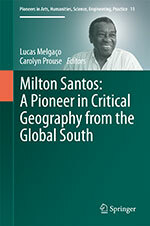 ): Milton Santos: A Pioneer on Critical Geography from the Global South (Cham– New York – Heidelberg – Dordrecht – London: Springer International Publishing, 2017)..
Lucas Melgaço - Tim Clarke (Eds. 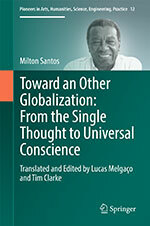 ): Milton Santos: Toward an Other Globalization From the Single Thought to Universal Conscience (Cham- New York - Heidelberg - Dordrecht - London: Springer International Publishing, 2017). Herbert C. Kelman and Ronald J. Fisher (Eds. 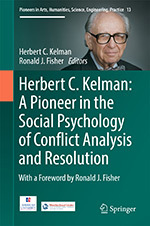 ): Herbert C. Kelman: Pioneer in the Social Psychology of Conflict Analysis and Resolution – Presented by Ronald J. Fisher. Pioneers in Arts, Humanities, Science, Engineering, Practice No. 13 (Cham- New York - Heidelberg - Dordrecht - London: Springer International Publishing, 2017). 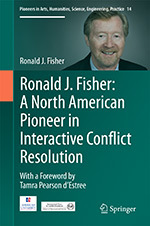 Ronald J. Fisher: Ronald J. Fisher: A North American Pioneer in Interactive Conflict Resolution. Pioneers in Arts, Humanities, Science, Engineering, Practice No. 14 (Cham – Heidelberg – New York – Dordrecht – London: Springer International Publishing, 2017). Marian Thomas Adolf: Nico Stehr: Pioneer in the Study of the Nature of Modern Society. Pioneers in Arts, Humanities, Science, Engineering, Practice (PAHSEP), No. 15 (Cham – Heidelberg –New York – Dordrecht – London: Springer International Publishing, 2017). Dan Caldwell (Ed. ): Alexander L. George: A Pioneer in Political and Social Sciences, Presented by Dan Caldwell, Pioneers in Arts, Humanities, Science, Engineering, Practice (PAHSEP), No. 16 (Cham – Heidelberg –New York – Dordrecht – London: Springer International Publishing, 2017). Úrsula Oswald Spring (Ed. ): Úrsula Oswald Spring: A Pioneer on Gender, Ecology, Peace, Security, and Development .Pioneers in Arts, Humanities, Science, Engineering, Practice (PAHSEP), No. 17 (Cham – Heidelberg –New York – Dordrecht – London: Springer International Publishing, 2017)..
Úrsula Oswald Spring: Úrsula Oswald Spring: Texts on Peasantry, Food Systems and Development with a Focus on Mexico. Pioneers in Arts, Humanities, Science, Engineering, Practice (PAHSEP), No. 18 (Cham- New York - Heidelberg - Dordrecht - London: Springer International Publishing, 2018). Úrsula Oswald Spring: Úrsula Oswald Spring: Texts on Ecology, Biodiversity, Water, Energy, on Climate Change, Environmental Migration, and as Minister of Ecological Development in Morelos. Pioneers in Arts, Humanities, Science, Engineering, Practice (PAHSEP), No. 19 (Cham-Heidelberg – New York - Dordrecht - London: Springer- Springer International Publishing, 2019). Úrsula Oswald Spring (Ed. ): Úrsula Oswald Spring: Texts on Peace, Peace Research, on Human, Gender and Environmental Security, on Sustainable-Engendered Peace, and Health and Disaster from a Gender Perspective. Pioneers in Arts, Humanities, Science, Engineering, Practice (PAHSEP), No. 20 (Cham-Heidelberg – New York - Dordrecht - London: Springer- Springer International Publishing, 2020).